Africa keeps calling me back because of the vast amount of game to be found there. You can see a 5-pound antelope called the suni up to a 14,000-pound African elephant. 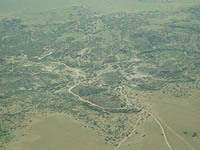 Africa homes many vast game-rich areas that are uninhabited. There’s also adventure in Africa where plenty of animals live that will kill you, which certainly adds a different element to the hunt than you find in the States. When you hunt in Africa, you have to respect the animals, or else they’ll hurt you. For instance, the cape buffalo, the lion, the hippo, the leopard and the crocodile all can hurt you, if you don’t respect them. But I’ve only named the big animals you need to look out for — you also needs to aware of other animals, including poisonous snakes like puff adders, black mambas and different types of cobras, which will add some adrenaline to your hunt. When you hunt in Africa, you’ll usually go in the middle of the country’s winter, which is the middle of our summer, particularly June – August, when not much hunting is going on here in the U.S. If you’re going to Africa to hunt with a bow or a gun, the first two animals I recommend you hunt for are the greater kudu, the most-majestic of all the plains animals, and the gemsbok. I believe that any first-time trip to Africa should be planned around taking the greater kudu. I think your chances are best for taking this animal in either Zimbabwe or South Africa, and you may include Namibia. The second animal I suggest you take is the gemsbok, which is always wide-awake and on-guard, looking for danger. The gemsbok moves in herds of seven to eight animals. I think all these animals in Africa are perhaps a notch higher on the alert scale than animals in North America because they have so many major predators that feed on them. Two more animals I believe should be on every African hunter’s top-10 list are the Livingston’s eland or cape eland and the nyala. The eland is one of the spiral-horned African antelopes and weighs in at 160-180 pounds. Amazingly an animal that big has the ability to clear an 8-foot-high obstacle. An eland is very athletic and a fine trophy. Because the eland is a herd animal, you may see as many as seven or eight animals together or perhaps 50 or 60 elands. You’ll often see bachelor groups of bulls that will have from four to six in a herd. These elands are ultra-alert, they see well, they smell well, and they hear well. Elands are always on the move, even when feeding, and they don’t stop very often. Tracking these animals for 7 to 10 miles before you catch up to them is not an uncommon occurrence. For the bowhunter, closing the distance on elands to at least 40 yards is a real challenge. The nyala is also one of the seven spiral-horned antelopes of Africa and weighs from about 180 to 200 pounds. 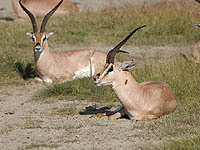 He’s a chestnut-colored antelope with 12- to 14-white vertical stripes and has a neck mane. He has white chevrons on his nose. His spiraling horns turn in and then back out and have ivory-colored tips. The nyala reminds me of the white-tailed deer, and this reason may be why I enjoy hunting the nyala so much. These animals like to live in a riverine country in thick brush. They carry themselves and behave very gracefully. An antelope that’s very much fun to hunt is the southern impala. The southern impala is slightly smaller than the nyala and generally weighs from 130 to 140 pounds. Like the other African antelope, the southern impala is a herd animal. One of the problems associated with hunting herd animals is that there are many more eyes, ears and noses to spot you than when you hunt animals not in a herd. 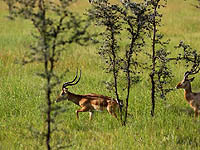 Pound for pound, the southern impala is one of the toughest animals in Africa to take and one of the most alert. Most bowhunters are familiar with the term, jumping the string, which is what happens when a deer crouches at the sound of the string before it leaps. The southern impala are much more likely to jump the string than a white-tailed deer is. If you plan to loose an arrow at 30 yards and want to make a hit, you have to aim low on the southern impala. I usually aim 6 to 8 inches low when I’m trying to take an impala. The springbok, the national animal of South Africa, even has its picture on South African currency. He is a very small antelope, and a big springbok may not weigh even 100 pounds. Predominantly living in herds, the springbok is a very graceful animal. Because of his coloration, the springbok is one of the more-attractive antelopes in Africa. Too, the meat of this antelope, like all the other antelopes we’ve talked about this week, is outstanding to eat. These antelopes are plains animals. Sneaking up on them is quite difficult, especially for a bowhunter. 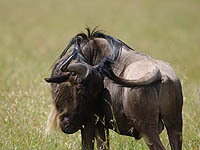 The next two animals I recommend adding to your African list of game animals to take is the wildebeest and the warthog. The wildebeest is one of the most-dominant species in all of Africa. On the Serengeti Plains in Tanzania, there’s an estimated 2 million wildebeests. These animals are the backbone of that entire eco-system. 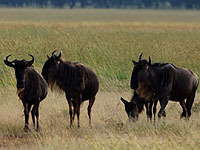 The wildebeests have a huge migration pattern that covers hundreds of kilometers each year. The wildebeests are scattered throughout South Africa and weigh about 250- to 300-pounds each. These animals are extremely difficult to sneak up on, because usually a large number of them will stay in a group, which makes them a real challenge for the bowhunter. With archery equipment, if you don’t make a perfect shot, a wildebeest will be very difficult to bring down. Warthogs are the comedians of Africa. Not only are they funny-looking, these pigs are fun to watch. Warthogs also are very impressive animals. The tushes on a big boar warthog often will be 17- to 18-inches long each, if you count the section of the tush that you can see outside the pig’s mouth and also the part of the tush that goes up into the hog’s skull. I not only like to hunt Russian boar and feral hogs but also enjoy hunting these warthogs with my bow. I think the world’s record warthog tush is around 24 inches. These hogs will weigh about 250 pounds, and with their large tushes, they make quite an impressive trophy. The warthog is one of the favorite foods of the leopard. So, the warthog is always looking for a leopard or some other animal to spring from cover and try to eat it. 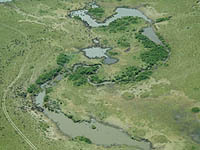 Since these pigs are always on the move, the best way to hunt them is often at a waterhole. 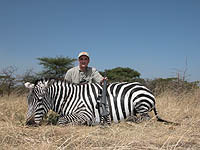 I would definitely have to have the zebra in my top-10 African trophies’ list for the first-time African hunter. The zebra is extremely intelligent and is a very beautiful animal. From a decorative standpoint, I can’t think of any hide that’s more beautiful than the zebra’s skin. 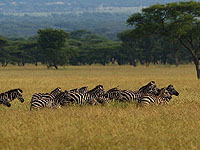 Although the zebra is not a primary food animal, Africans do eat zebra regularly. Like the other animals of Africa, the zebra is a herd animal and lives to older ages. Finding a 25-year-old zebra is not unusual. An animal that old is quite wary, because it’s avoided predators for a long time and survived. A trophy zebra will be a stallion that’s at least 10-years old that doesn’t have a scarred-up hide. The last animal on my list for what a first-time hunter in Africa needs to take is the baboon. Of all the animals I’ve ever hunted in Africa, the baboon is one of the most alert. The baboon is the favorite prey species of the leopard. Therefore baboons are always on the lookout for the slightest movements that will signal danger. Baboons always travel in large groups, and you’ll rarely ever see less than 20 animals at a time. The dominant males and the dominant females take on the responsibility of watching for danger for the whole group. Anytime you see baboons, you’ll generally see one or two baboons high up in a tree, searching for danger while the other animals are feeding. 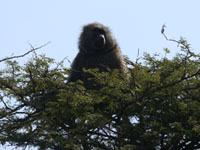 At the first sign of danger, an alarm call is given, and the baboons will flee the area. I’ve watched baboons before at a water hole when I’ve been absolutely still and wearing a Leafy Wear camouflage suit. Although I look as natural as possible, still I’ve had a baboon look up in a tree from 30-yards away before and recognize me as something that’s not supposed to be there and sound the alarm call. Then all the baboons will run off. I’ve never had any other animal this capable of recognizing me when I’m that camouflaged and that still. I believe that a big male baboon is one of the most-difficult and interesting trophies in Africa that you can take. Although I don’t want a lifesize baboon mounted in my house, the skull of a big mature male baboon is one of the most-interesting skulls I’ve ever taken.